One year later, due to a lack of leadership, these promises won’t likely survive the legislative session. Once again, we get a lot of talk, but little real action. Today, Perry signaled to Texas House Republicans that these promises really no longer matter. If that’s not bad enough, Gov. Perry is asking House Republicans to walk the plank for him in support of busting the spending cap, putting Texas further into debt, and raiding the Rainy Day Fund. In exchange, Perry promised to campaign for those legislators who would follow him in this reckless quest to betray the conservative base and to violate foundational conservative principles. Our answer? Anyone thinking about following this unprincipled approach should remember the “Cruz Missile” that blew up all conventional political wisdom last year and sent an earthquake through the middle of Austin. The conservative grassroots of Texas that united to send Ted Cruz to the United States Senate is more committed than ever to protect this state from the establishment ruling class in both parties. We will consider any votes to bust the spending limit, to drive Texas further into debt, and to drain the Rainy Day Fund to be a declaration of war on our children and grandchildren. Texas is NOT Washington, DC, and we don’t take kindly to betrayal. Women On the Wall takes on the issues that matter. Sharing information and updates on our weekly radio show on Monday mornings at 10 am CST. You will not want to miss this show. We take on the issues that are effecting the safety and security of our children and grandchildren. Not So Fast Mike Villarreal and Dan Branch~ HB 2103 Must be Stopped! Texas Representative Mike Villarreal and Rep. Dan Branch have introduced HB 2103. Interested parties assert that student data collected by the Texas Education Agency should be made more accessible to researchers so that it can be used to improve the state’s education system. C.S.H.B. 2103 aims to provide for this increased accessibility and also seeks to establish an education research center advisory board and set limits on who can request research, which would allow the Texas Higher Education Coordinating Board to sift through fewer requests and approve researchers in a more timely manner. “This would deepen the impact of “school-to-work” which is the German / Prussian education system.”. Ok Moms and Dads are you really ok with this? The P20 Council is to create a State DATA Base for Education Researchers. P20 database is tasked with collecting information (data points) on Texas students from early childhood to workforce-aged youngsters. Call your Representative Today and Say NO to HB 2103. Why would we trust a P20 Board with our children and their Teacher’s private data when things like this are happening in Texas. TEA (Texas Education Agency) and the ESC (Education Service Centers) spent $31,900,000 from a grant to develop a training program for educators and administrators. The objective being that Texas teachers would be given specifics about the TEKS. Teachers attending the sessions would leave with a scope of the TEKS (descriptions of the TEKS for the grades and subjects they teach). With information about the TEKS and their school calendar, teachers would have all the tools they need to develop a sequence (yearly schedule) for each subject. During the senate ed committee meeting, the superintendents didn’t say a thing about this material. In fact they gave testimony that without CSCOPE they have no specifics about the TEKS. The ESCs had to have spent much time developing TEKS training material for K-12 in all subjects. What is the difference in the CSCOPE scopes and sequences and the TEKS Profession Development Initiatives scopes and sequences? Every Texan needs to know just how their tax money is being spent. Every Texan needs to know that those in charge of the ESCs are not being governed and are free to spend our tax money as they see fit. Every Texan needs to contact their ESC and ask for original copies of the TEKS Professional Development Initiatives paid for by a $32 million grant–their tax money provides this. At the Capital in Austin on Jan. 31st the photo below was taken. It was Texas Muslim Day. Of the 12 sponsoring groups 8 have direct ties to the Muslim Brotherhood. So it is not surprising to find out….. When it comes to Senator John Carona’s legislation, SB1639, Texas’ American Laws for American Courts legislation, our opponents become more vocal as we get closer to victory.And we are VERY close to victory in Texas. 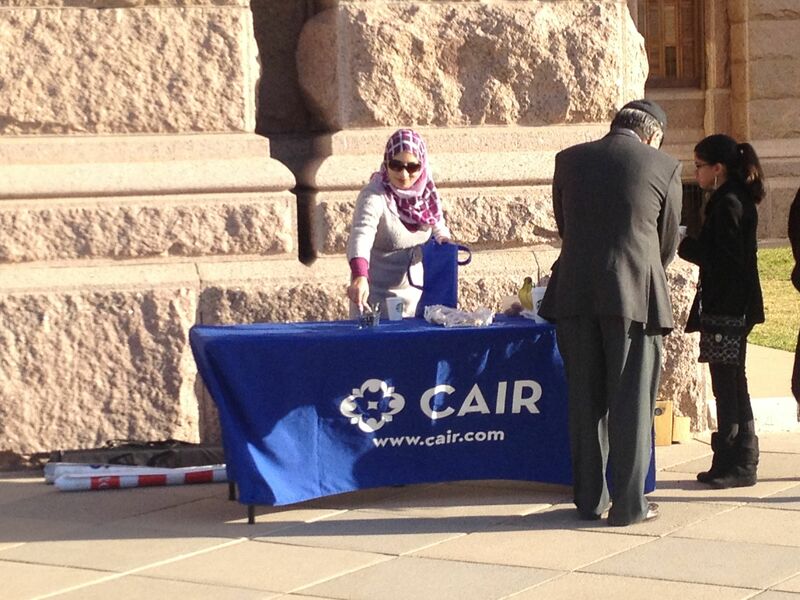 One such opponent is the Council on American Islamic Relations (CAIR), an unindicted conspirator in the Texas Holy Land Foundation terror finance trial and a Muslim Brotherhood front group operating right here in the U.S.
Pro-ALAC patriots: We need the voices of Texas to tell the ALL State Senators what the bill REALLY does…and what it does NOT do. We need your voice today. As a reminder, SB1639 is merely common-sense proposal protects Texans’ individual constitutional rights from foreign laws or legal doctrines in cases related to marriage, divorce, or parent-child relationships, where the application of those laws/doctrines would violate those constitutional rights. No particular foreign law is singled out. The legislation applies to them all. SB 1639 was recently passed out of the Texas Senate Business & Commerce Committee by a vote of 5 to 4. The next step is for the Rules Committee to send the legislation to the Senate floor for a final vote. At this time, we need all of our Texas members to relay their strong support for SB 1639 to their individual state Senator. By continuing to work together, we can see American Laws for American Courts legislation passed in Texas this session! In order to see ALAC passed into law in Texas, can we count on you to perform the following easy action today? We need your help TODAY in contacting YOUR STATE SENATOR to relay your strong support for SB 1639 and your desire to see the bill reach the Senate floor as soon as possible for a vote. I urge you to support SB 1639, introduced by Senator John Carona, in order to protect the constitutional rights of Texans from the incursion of foreign laws and foreign legal doctrines. Further, I ask that you do all you can to see this important bill brought before the full Senate so it can receive the vote it deserves. To-date, four other states have passed legislation like SB 1639. Texas needs to be next, as we must maintain the authority of the Texas and U.S. Constitutions. As a Texas voter, this bill is of the utmost importance to me! Thank you for your leadership on this vital matter. Again, many thanks for all of your efforts, Texas. 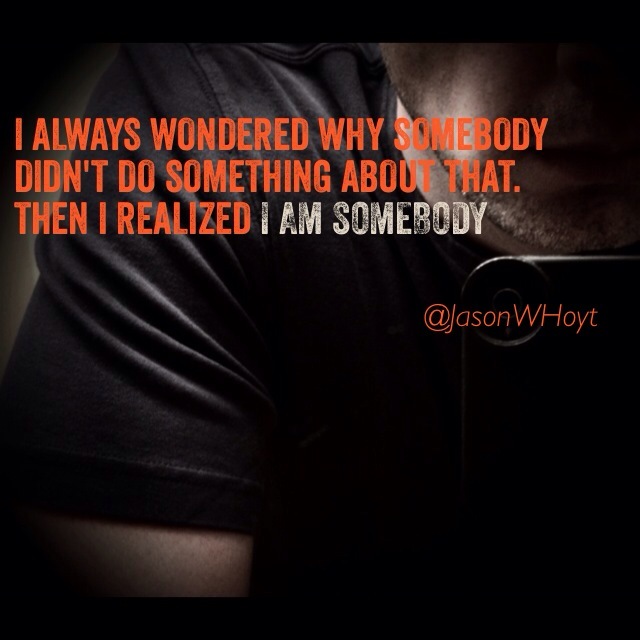 You ARE making a difference! 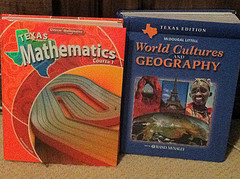 Do you want to help put a big dent in the development of CSCOPE courses in the Texas Virtual School Network? The obsolete government entity (Harris County Department of Education) that I have been trying to shut down for the past two years is the developer/provider of the CSCOPE courses in the Texas Virtual School Network. Now I know why there are so many educational big shots trying to keep them open. They are actually the Harris County School Trustees, an entity left over from the days when counties operated our public schools in Texas – before the onset of the ISD. Believe it or not, Harris County still elects County School Trustees over 50 years after our last countywide school closed! I have been fighting to shut them down because they are a duplicate of ESCs – thus a waste of our local tax dollars. I had no idea I was fighting CSCOPE too. The bill to close them down will be heard on Tuesday April 16th. If you will be in Austin (or know someone who will be) who also wants to take down CSCOPE, you can help by simply signing in at the Capital on Tuesday morning in support of HB 945. You must come in person to register your support “For” the bill to have your name in the public record. You do NOT need to speak. That’s all you have to do. You do not have to attend the hearing. Just a large number of people registering support FOR the bill would be very helpful. Funny that I have been working on two bills, this one and CSCOPE and had no idea they were related until now. 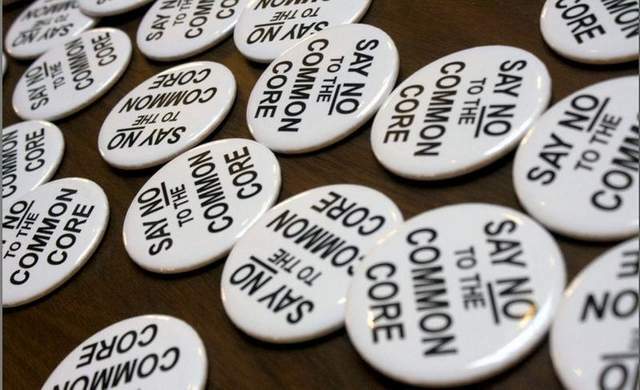 The National Republican Party passed a resolution against Common Core in their platform. Yeah! 2. Federal Law 20 USC 1232a-Sec. 1232a. and The Elementary and Secondary Education Act (ESEA) Pub.L. 89-10, 79 Stat. 27, 20 US.C. ch. 70. Next, there are also three different types of individuals involved; and we can see this all across America. 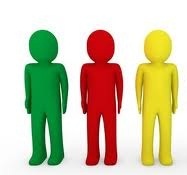 Politicians can come in all different colors – green, yellow, and red. Those who blindly follow are green. Those who seek fame, fortune, and/or control for themselves are yellow. Those whose aim is to change America from a capitalist, free-market Republic into a Socialist, Communist, Marxist country are red. I do not believe that very many of our Texas Legislators fall into the “red” category, but I do believe many of them do fall into the “green” or “yellow” categories. The TEKS (curriculum standards – not curriculum) tell school districts/educators WHAT to teach. It is left up to the local teachers to decide HOW to teach them. As you look over the TEKS, you will find that most of them are knowledge-based, academic, grade-level-specific for each grade level or each course; and the standards (i.e., elements) are largely measurable. Those were the parameters set by the elected SBOE back in 2005-2006 before they started adopting the new set of TEKS. These specific parameters were set so that the writing teams would be forced into Type #1. As you scan through the various subjects and grade levels in the new TEKS, please notice the verbs used at the beginning of the standards. The verbs have deliberately been chosen to bring measurability to the standards such as identify, create, interpret, locate, examine, describe, explain, compare, summarize, master, demonstrate, follow, communicate, incorporate, use, apply, evaluate, organize, etc. This is the Type #1 philosophy of education – no subjectivity, feelings, opinions, etc. The new Type #1 TEKS emphasize academic knowledge – the right answer – instead of the “process.” This is why school districts that have become totally fixated on constructivist, project-based learning (e.g., CSCOPE districts) are not in alignment with the Type #1 TEKS because the constructivist/project-based activities glorify the process rather than the right answer. Can you find any of the new TEKS that say discover, give your opinion, what do you think, etc.? These are Type #2 verbiage. Because of the parameters set by the SBOE for the new TEKS before the writing teams even met, the new Type #1 TEKS elements can be measured on the STAAR/End-of-Course tests largely through objective questions and answers. Because of these parameters, the constructivist, project-based philosophy of education as seen in CSCOPE does not align well with these new TEKS and explains why the CSCOPE schools did worse on their STAAR/EOC’s than did the non-CSCOPE schools. This also should help us to understand why we must not lose the “measuring stick” – the STAAR/EOC’s. If the truth were known, I imagine Pearson really enjoyed producing and then setting up the “answer keys” for the STAAR/EOC tests for Texas because our standards are clear, precise, and measurable. Producing a test for a “road map” (Type #1) is much easier than producing a test for a “wish list” (Type #2). If we want our high-school students to know how to research a topic and then put that information into well-written text, we must have Type #1. If we want legislators who are well read and who have a deep understanding of world history/American history/U. S. legal system and how those apply to current events, then we must have Type #1. I’m calling for a hogwash alert on today’s National Review article about Common Core. The ironically titled The Truth About Common Core article cannot be taken seriously. It’s written without any links or references for its Common Core-promoting claims, and it’s written by two authors whose employers are largely funded by the main funder of all things Common Core. Can anyone take seriously those who praise Common Core while being paid to do so? The article makes “truth” claims that include the notion that Common Core is “more rigorous,” (where’s the proof?) and that the standards allow policymaking to happen locally. How can that be? The standards are written behind closed doors in D.C. The standards are copyrighted and are unamendable by locals. There is a 15% cap on adding to them, written into the ESEA Flexibility Waiver Request. And there is no amendment process; thus, no local control. For anyone who has been living under an education reform rock, know this: Gates is the single biggest promoter and funder of Common Core, bar none.) So, Fordham’s and Manhattan Institute’s writers should not be expected to be objective about Common Core. If it seems like practically everyone supports Common Core, Gates’ money is why. Bill Gates has said he’s spent $5 BILLION pushing (his version of) education reform. He’s bribed the national PTA to advocate for Common Core to parents; he’s paid the CCSSO to develop Common Core; and he owns opinion maker Education Weekmagazine. There’s a near-endless list of Gates’ attempts (very successful, I might add) to foist his vision of education without voter input. But we should clarify that oodles of Democrats and Republicans sell or benefit from Common Core implementation. That is the top reason for the gold rush anxiety to promote the national standards. A secondary reason is lemminghood (misplaced and unproven trust). Republican Jeb Bush is behind the Foundation for Excellence in Education, a nongovernmental group which pushes Common Core and is, of course, funded by Gates. Republican Rupert Murdoch owns not only Fox News, but also the common core implementation company Wireless Generation that’s creating common core testing technology. Republican Senator Todd Huston of Indiana got his largestcampaign donation from David Coleman, common core ELA architect; then, after Huston was elected to the Indiana Senate and placed on its education committee, Coleman hired Huston to be on the College Board. They are profiting from the alignment of the SAT to Common Core. And of course, Huston is on Jeb Bush’s Foundation for Excellence in Education, too. Even my own Republican Governor Herbert of Utah serves on the elite executive committee of NGA, the Common Core founding group. He doesn’t make money this way, but he does make lots of corporations happy. I could go on and on about the Common Core gold-and-glory rush. I haven’t even touched on all the Democrats who promote Common Core for gain. But I don’t want to be up all night. 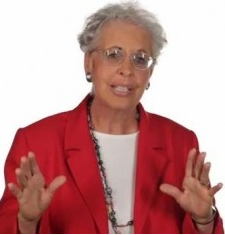 California Democrat/author Rosa Koire and respected educator like Diane Ravitchoppose Common Core as an untested academic and political experiment that increases the high-stakes of standardized testing. They see that Common Core is promoting unrepresentative formations of public-private-partnerships, and promotes teacher-micromanagement. Chicago history teacher Paul Horton says Common Core turns teacher-artisans into teacher-widgets; he also sees it as a Pearson anti-trust issue. Teacher Kris Nielsen has written “Children of the Core” and teacher Paul Bogush calls teaching Common Core sleeping with the enemy. Math teacher Stephanie Sawyer predicts that with Common Core, there will be an increase in remedial math instruction and an increase in the clientele of tutoring centers. Writing teacher Laura Gibbs calls the writing standards an inspid brew of gobbledygook. Anonymously, many teachers have published other concerns in a survey produced by Utahns Against Common Core. Still, political funders of the standards and corporations selling its implementation try to get away with marginalizing the opposition. But it can’t be done honestly. Because it’s not a fight between left and right. This battle is between the collusion of corporate greed and political muscle versus the individual voter. It’s a battle between the individual student, teacher, or parent– versus hugepublic/private partnerships. That’s the David and Goliath here. 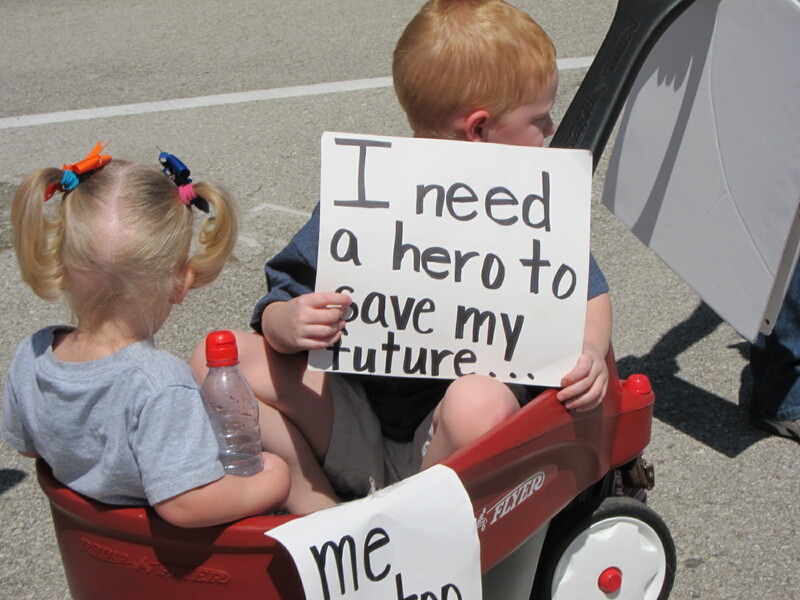 The Common Core movement is not about what’s best for children. It’s about greed and political control. A simple test: if Common Core was about helping students achieve legitimate classical education, wouldn’t the Common Core experiment have been based on empirical study and solid educator backing? Did the authors of the Hogwash article really not know that Common Core wasn’t based on anything like empirical data but simply fluffed up on empty promises and rhetoric, from the beginning. Where’s the basis for what proponents call “rigorous,” “internationally competitive,” and “research-based?” Why won’t the proponents point to proof of “increased rigor” the way the opponents point to proof of increased dumbing down? We know they are fibbing because we know there is no empirical evidence for imposing this experiment on students in America. The emperor of Common Core is wearing no clothes. Many educators are crying out –even testifying to legislatures— that Common Core is an academic disaster. I’m thinking of Professors Christopher Tienken, Sandra Stotsky, Thomas Newkirk, Ze’ev Wurman, James Milgram, William Mathis, Susan Ohanian, Charlotte Iserbyt, Alan Manning, and others. The National Review authors insist that Common Core is not a stealth “leftist indoctrination” plot by the Obama administration. But that’s what it looks like when you study the reformers and what they create. Pearson’s latest textbooks show extreme environmentalism and a global citizen creating agenda that marginalizes national constitutions and individual rights in favor of global collectivism. The biggest education sales company of all the Common Core textbook and technology sales monsters on the planet is Pearson, which is led by mad “Deliverology” globalist Sir Michael Barber. Watch his speeches. He doesn’t just lead Pearson, the company that is so huge it’s becoming an anti-trust issue. Sir Michael Barber also speaks glowingly of public private partnerships, of political “revolution,” “global citizenship” and a need for having global datacollection and one set of educational standards for the entire planet. He’s a political machine. Under his global common core, diversity, freedom and local control of education need not apply. Along with some of the gold-rushing colluders chasing Common Core-alignment product sales, there are political individuals calling educational shots, and these are without exception on the far, far left. And of these, the National Review is correct in saying that their goal to nationalize U.S. education has been happening since long before Obama came to power. But they are wrong in saying that Common Core isn’t a road map to indoctrinating students into far left philosophy. Power players like Linda Darling-Hammond and Congressman Chaka Fattah ram socialism and redistribution down America’s throat in education policy, while Pearson pushes it in the curriculum. It’s safe to say that Linda Darling-Hammond has as much say as anyone in this country when it comes to education policy. She focuses on “equity” and “social justice” –that is, redistribution of wealth using schools. Reread that last sentence. Darling-Hammond has worked for CCSSO (Common Core developer) since long before the standards were even written. She served on the standards validation committee. She now works for SBAC (the Common Core test writer); she also consults with AIR (Utah’s Common Core test producer) and advises Obama’s administration; she promotes the secretive CSCOPE curriculum and more. Study her further here to learn the groups she works for, what’s in the books she writes, how many times she quoted herself in her report for the U.S. equity commission, and what she said in last summer’s speech to UNESCO about the need to take swimming pools away from students. So yes, there is an undeniable socialism push in Common Core textbooks and in the Department of Education. The National Review’s authors claim Common Core won’t “eliminate American children’s core knowledge base in English, language arts and history.” By cutting classic literature by 70% for high school seniors, they are absolutely doing exactly that. The article says that Common Core doesn’t mandate the slashing of literature. Maybe not. But the tests sure will. What teacher, constricted by the knowledge that her job is on the line, will risk lowering the high stakes student scores by teaching beyond what is recommended in the model curriculum of the national test writers? And that’s the tragic part for me as an English teacher. Classic literature is sacred. Its removal from American schools is an affront to our humanity. Common Core doesn’t mandate which books to cut; the National Review is correct on that point; but it does pressure English teachers to cut out large selections of great literature, somewhere. And not just a little bit. Tons. Informational text belongs in other classes, not in English. To read boring, non-literary articles even if they are not all required to be Executive Orders, insulation manuals, or environmental studies (as the major portion of the English language curriculum) is to kill the love of reading. What will the slashing do to the students’ appreciation for the beauty of the language, to the acquisition of rich vocabulary, to the appreciation for the battle between good and evil? We become compassionate humans by receiving and passing on classic stories. Souls are enlarged by exposure to the characters, the imagery, the rich vocabulary, the poetic language and the endless forms of the battle between good and evil, that live in classic literature. Classic stories create a love for books that cannot be acquired in any other way. Dickens, Shakespeare, Hugo, Orwell, Dostoevsky, Rand, Marquez, Cisneros, Faulkner, Fitzgerald– where would we be without the gifts of these great writers and their writings? Which ones will English teachers cut away first to make room for informational text? The sly and subtle change will have the same effect on our children as if Common Core had mandated the destruction of a certain percentage of all classic literature. How does it differ from book burning in its ultimate effects? Cutting out basic math skills, such as being able to convert fractions to decimals, is criminal. Proponents call this learning “fewer but deeper” concepts. I call it a sin. Common Core also delays the age at which students should be able to work with certain algorithms, putting students years behind our mathematical competitors in Asia. The National Review claims that the standards “simply delineate what children should know at each grade level and describe the skills that they must acquire to stay on course toward college or career readiness” and claim they are not a ceiling but a floor. This is a lie. The standards are bound by a 15% rule; there’s no adding to them beyond 15%. That’s not a ceiling? The article insists that Common Core is not a curriculum; it’s up to school districts to choose curricula that comply with the standards. Sure. But as previously noted: 1) all the big textbook companies have aligned to Common Core. Where are the options? 2) Common core tests and the new accountability measures put on teachers who will lose their jobs if students don’t score well on Common Core tests will ensure that teachers will only teach Common Core standards. 3) Test writers are making model curriculum and it’s going to be for sale, for sure. The article falsely claims that “curriculum experts began to devise” the standards. Not so: the architect of Common Core ELA standards (and current College Board president) is not, nor ever has been, an educator. In fact, that architect made the list of Top Ten Scariest People in Education Reform. A top curriculum professor has pointed out that the developers of Common Core never consulted with top curricular universities at all. The article claims that states who have adopted Common Core could opt out, “and they shouldn’t lose a dime if they do” –but Title I monies have been threatened, and the No Child Left Behind waiver is temporary on conditions of following Common Core, and for those states who did get Race to the Top money (not my state, thank goodness) the money would have to be returned. Additionally, every state got ARRA stimulus money to build a federally interoperable State Longitudinal Database System. Do we want to give back millions and millions to ensure that we aren’t part of the de facto national database of children’s longitudinal school-collected, personally identifiable information? The article states that the goal is to have children read challenging texts that will build their vocabulary and background knowledge. So then why not read more –not less– actual literature? The article also leaves out any analysis of the illegality of Common Core. The arrangement appears to be illegal. Under the Constitution and under the General Educational Provisions Act (GEPA) the federal government is restricted from even supervising education. And for those still believing the federal government isn’t “exercising direction, supervision or control” of the school system, look at two things. 1. The federal technical review of tests being mandated by the Department of Education. 3. The recent federal alteration of privacy laws that have taken away parental consent over student data collection. Finally: the “most annoying manipulation tactic” award for the National Review Article is a tie between the last two sentences of the National Review article, which, combined, say, “Conservatives used to be in favor of holding students to high standards… aren’t they still?” Please. Americans used to be in favor of legitimate, nonexperimental standards for children that were unattached to corporate greed and that were constitutionally legal… Aren’t we still? I listened to the Senate Education Committee’s public hearing on various bills yesterday morning. One of the first people to testify was Texas Commissioner of Education Michael Williams, and various responses between him and Sen. Dan Patrick occurred as they discussed the present high-school graduation requirements vs. Sen. Patrick’s SB 3 and SB 1724. Sen. Patrick tried to justify SB 3 by saying it increases academic requirements. However, Tex. Ed. Comm. Michael Williams explained that presently only 20% of our high-school students elect to go into the least rigorous Minimum graduation plan because the default plan (the norm) is the more rigorous Recommended 4 x 4 plan (4 years each of English, Math, Science, and Social Studies). Under Sen. Patrick’s SB 3, the Foundation plan would become the default plan (the norm). This would undoubtedly result in a much larger percentage of students choosing to take only the Foundation courses instead of taking the more rigorous Recommended or Advanced (i.e., Distinguished) courses. Sen. Patrick’s Foundation plan is only slightly more rigorous than the present Minimum plan. By allowing a large swath of our Texas high-school students to graduate under the Foundation plan rather than the more rigorous plans, we can expect the largest percentage of graduates under SB 3 to walk across the stage at graduation having a lower level of foundational knowledge and skills. Right now, 80% of Texas students are in the Recommended degree plan; none have walked across the stage yet because they are presently high-school sophomores and freshmen. Out of those students who have graduated under the “old” plan, only 48% have gone on to higher education in Texas. Sadly, 30% of those have required college remediation. It is for this reason that the SBOE working with the Texas Education Agency decided to implement the 15 STAAR/End-of-Course tests in English/Math/Science/Social Studies – to measure, show, and push toward better teaching and learning in these courses. Like it or not, the fact is that high-stakes STAAR/End-of-Course tests motivate both teachers and students to strive for a higher standard. If the legislature decides to gut these EOC’s in the four core courses (Grades 9 – 11), then how can we possibly believe that the educational level of students graduating from our Texas high schools will improve over what is occurring right now? Presently less than half of our high school graduates go on to college (48%), and 30% of those require remediation before they can even get started receiving college credit. A debate over Algebra II occurred at the hearing. Sen. Patrick said he had heard that colleges/universities no longer consider Algebra II to be an indicator of college readiness. Comm. Williams said he had heard that rumor but had not seen anything definitive. Sen. Patrick asked Comm. Williams to gather data on this issue. What the public and legislators need to understand is that the reason colleges/universities may have lost confidence in the Algebra II course is that the “old” dumbed-down TEKS (curriculum standards) have been in our schools since 1997. The majority of students graduating under those standards (today’s juniors and seniors) most likely do not have the college-ready skills that they need. The requirement for students to take Algebra II is not the problem; the problem is that the rigor in math all the way through school under the old Math TEKS (passed in 1997) simply has not been there. The new more rigorous TEKS (adopted starting in May 2008) and the more rigorous STAAR/EOC’s have not even produced any high-school graduates yet. Only sophomores on down have been exposed to the more rigorous TEKS and STAAR/EOC’s. If the legislature will just take their hands off the present New Plan (15 EOC’s, 4 x 4 course requirements) and allow it to go forward, the graduates who emerge from this year’s sophomores will prove that taking Algebra II, the other 4 x 4 courses, and the15 End-of-Course tests have indeed elevated their college-ready/workforce status. At yesterday morning’s Senate hearing, another discussion ensued over Pearson(the largest publishing company in the world and the producer of the STAAR/EOC’s). Sen. Patrick asked Comm. Williams to produce data to show how many tests each year Pearson scores nationally and how much time each evaluator spends on each subjectively scored question. Exactly! That is why Type #1 TEKS are so important and why we fought to get Type #1 TEKS adopted by the Texas State Board of Education (SBOE) starting in May 2008. The old Type #2 TEKS and TAKS tests were very subjective, and that is why teachers had to teach their students “to play the TAKS game” in order to help them pass those subjectively graded TAKS tests. The Type #1 STAAR/EOC tests are a “different animal.” These new tests contain a majority of objectively scored questions with right-or-wrong answers. Subjectivity is a bad thing on high-stakes tests given at the state (or national) level because the value system of whoever evaluates the questions is an all-important and subjective factor. On the new Type #1 ELAR-STAAR/EOC alone there are some 40 right-or-wrong grammar/usage objectively scored questions. This was not the case on the old TAKS tests in which much more subjectivity was the norm. The new, fact-based, academic, Type #1 TEKS have made it much easier for Pearson to create right-or-wrong, objectively scored questions; and this has cut down on the subjectivity in grading the STAAR/EOC’s. Comm. Williams explained that the STAAR/EOC’s have only been given for one year (School Year 2011-12) and that over time, the teachers will adjust by increasing their own content knowledge so that they are able to raise the level of instruction in their classrooms. Parents need to be patient while the New Plan begins to take hold in their children’s classrooms. Students need to be patient while they move steadily into learning more content knowledge at each grade level. This in turn will eventually raise their academic levels so that the STAAR/EOC’s will not frighten them anymore. Administrators need to be patient also. After this year’s juniors have taken the TAKS tests, high schools will not have to worry about giving both the TAKS and the STAAR/EOC’s. By this time next year when this year’s sophomores and freshmen pass to the next grade levels, the New Plan will largely be in place except for the seniors IF only the legislature will back away from gutting what we who care about children and their future have worked ten years to accomplish – authentic education reform in Texas. Legislators need to be patient and give the New Plan time to work. At this point only the high school sophomores on down have experienced the rigor and depth of instruction in the new Type #1 TEKS. It would be a terrible shame for this group of Texas Legislators to go down in history as the ones who prevented Texas from leading the country in education reform. Even worse yet, it would be a blot on these legislators’ heads if the colleges, universities, and the workforce in years to come were able to lay the blame for the downfall of the Texas economy on the 83rd Legislative Session. 4.2.13 *I took notes of this meeting as fast as I could, and I trust that the information presented is accurate. 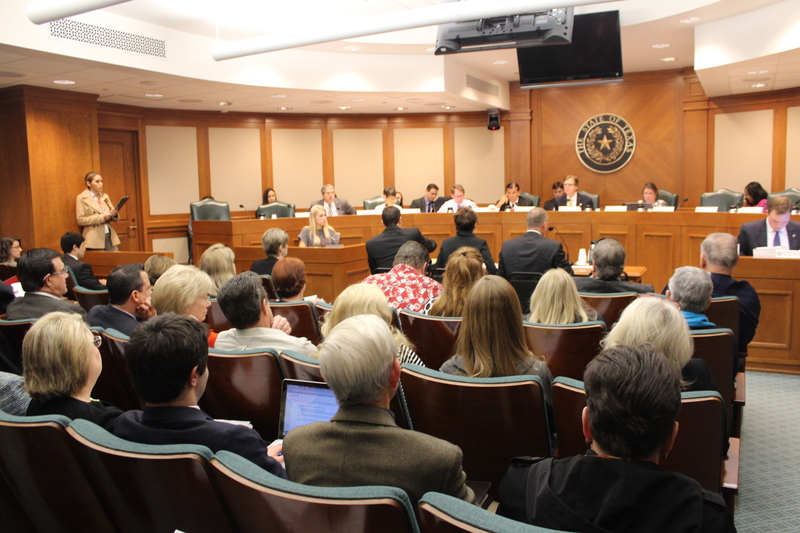 Same story, second verse — Back on Jan. 31, 2013, the Texas Senate Education Committee held a public hearing on CSCOPE. 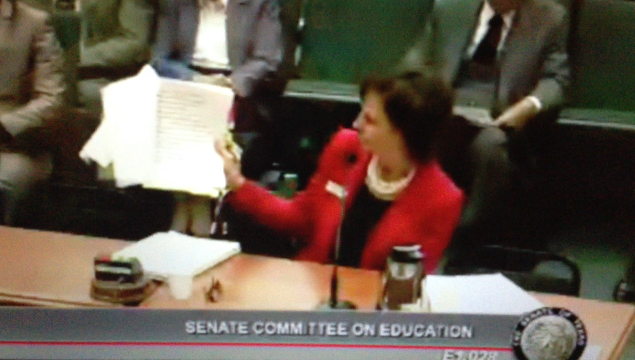 Today, April 2, 2013, another public hearing on CSCOPE was held by the same Sen. Education Committee; but this time the hearing was tied to a piece of legislation — SB 1406. SB 1406 seeks to give the elected members of the Texas State Board of Education (SBOE) oversight and direction over CSCOPE. Basically two groups of people testified today. One group was made up of the school administrators and school boards who think they cannot live without CSCOPE. They claim CSCOPE is a much-needed management tool and that their districts cannot possibly afford the expense of writing their own curriculum. Hence, CSCOPE is the answer to all their problems! Never mind that qualified teachers have always been able to write their own excellent lesson plans for eons. The other group was made up of the parents and the citizens of Texas who are concerned with the many very troubling aspects of CSCOPE and who either want the Texas State Board of Education to be given oversight and direction over CSCOPE or else want to put CSCOPE completely out of business. The first group seemed more concerned about CSCOPE giving them a system to micromanage classroom teachers while the latter group talked about their concerns over what their children and other Texas children are actually learning in the CSCOPE lessons. vulnerable minds from being taught erroneous and sometimes biased CSCOPE lessons. It is important to point out that all of the many school administrators who came to testify were getting paid for their mileage, meals, time away from school, and overnight accommodations. The parents and the public who came to testify did so on their own dime. They took off work or else left their families to drive all the way down to Austin. If I were a Texas Senator, I would take much more seriously the concerns of those people with no vested interests. The school administrators all talked from the same playbook (as usual). Most of them had been misinformed about the bill and thought it was a bill to take local control away from their districts. Senator Campbell explained to the school administrators that legislators appropriate dollars for education and are accountable constitutionally (1) to make sure those funds are spent efficiently and (2) to see that an adequate education is provided for Texas’ public school students. The Senator said that since CSCOPE is flawed with errors and had been shrouded in secrecy that a light needed to be shined on it. She emphasized that SB 1406 does not take away local control. It makes sure that legislators are held accountable for the funds that are entrusted to them by the taxpayers. Barbara Cargill, chair of the Texas State Board of Education (SBOE), described how she had been asked by Senator Patrick to appoint an ad-hoc committee. It met on Friday, March 29, in Dallas, Texas. The ad-hoc committee is made up of four SBOE members and three CSCOPE directors including the state TESCCC director. Cargill explained that on April 22 – April 29, the public can start applying to be on the review panels. May 13 is the hard deadline for SBOE members to submit their panel nominations. Three to nine people will be chosen for each panel based upon the number of CSCOPE lessons assigned to them. Selected panel members will be notified by May 20, and passwords will be assigned. All of the reviews will be done virtually. The end goal is to review all of the 400 lessons and tests in the Social Studies component of CSCOPE. (The total of CSCOPE lessons in all four subject areas is close to 1,600). The panels are to finish going through the first two six weeks of lessons between June 3 – 16. If the panel members need to meet, they can go to their nearest Education Service Centers and participate through videoconferencing. This will keep the costs down and will keep the panel members from having to travel and be gone from home. The SBOE approved operating board rules in its January 2013 meeting; and taking the objectives for instructional materials approved by the Board, Cargill hopes to combine these to form an easy-to-use, objective checklist that the panels can utilize in their evaluations. SB 1406 does not require TESCCC/CSCOPE to implement the recommendations of the review panels, but it is hoped that TESCCC/CSCOPE will choose to do so rather than experience the public’s animosity if the SBOE’s good faith gesture is ignored. Cargill pointed out that the SBOE is doing this review without any cost to TESCCC/CSCOPE and that they should be glad to utilize the panels’ findings. Throughout the five-hour hearing on SB 1406, it did not seem to matter how many mistakes, flaws, misspellings, grammatical errors, factual errors, inappropriate, and biased statements were documented. The school administrators sang CSCOPE’s praises as if they had not even heard any of the negatives that were presented. Hardly any of the administrators seemed bothered about CSCOPE’s secrecy, lack of transparency, the teacher “gag” order, and the highly unethical (or illegal) incorporation of TESCCC operating as a shell company after using taxpayers’ dollars to create its product — all done without permission from the Texas Legislature. Sen. Patrick asked one of the ESC directors to provide the Senators with a breakdown of how the $15 to $16 Million paid to CSCOPE last year was utilized (e.g., how much was paid to the writers, etc.) The director stated that the people at the ESC’s who work on CSCOPE draw their salaries from the ESC’s and that their jobs are dependent upon CSCOPE’s success. Since the Jan. 2013 public hearing, TESCCC has agreed to dissolve itself; but Sen. Patrick said that if CSCOPE continues to stay in the lesson plan business, it may be necessary to create a statute that will make sure no backtracking occurs. Witness Colleen Vera presented documents she was finally able to get from TESCCC’s released board minutes that showed the directors had talked about selling CSCOPE to other states. She also found a statement from a 2011 meeting in which the directors were discussing whether CSCOPE’s primary goal should be just making money or serving the children of Texas. Testifier Peggy Venable who travels widely around the state of Texas said she has heard CSCOPE complaints everywhere she has gone. She said she has yet to meet any citizens and/or parents who like CSCOPE. Jeanine MacGregor presented the Senators with actual examples of CSCOPE lessons that have been plagiarized. She also showed the Senators a slide (Slide #8) from a CSCOPE/TESCCC power point that vilified by name some of the people who had come to the Jan. 31, 2013 Senate Education Committee hearing and had testified against CSCOPE. Sen. Patrick was visibly upset that such a list had been circulated and said the Texas Attorney General would be notified so that he could track down who (ESC, TESCCC, local school district, individual) had initiated Slide #8. Neal Fry offered a replacement bill for SB 1406 that would take care of the glaring double standard that exists in SB 6 regarding textbooks vs. online curriculum. Deborah Parrish presented her concerns about the lack of phonics instruction in CSCOPE. She said that research from Johns Hopkins shows phonics is a major tool especially with low-income students. She stated that the 60% of Texas children who come from low-economic homes are the ones who are being hurt by CSCOPE the most because of the lack of phonics instruction. Senator Campbell voiced her concern about the questionable CSCOPE lessons that have been removed by TESCCC once located but that have misinformed students for many years. Sen. Patrick indicated his concern with the large number of curriculum standards that are found in the TEKS and wants the next legislative session to consider reducing the number of TEKS elements. A number of people chose to register their positions rather than to testify, and the total number of people for and against SB 1406 appeared to be about equal.